After a fresh snow, an icy snow or blizzard, the day is filled with sparkles when you look against the sky. In photography, it’s easy to capture – line up the sun, the light, move around, and you get it. In painting, though, it’s a totally different thing. How to express that sparkle? I tried to capture it in the upper left corner by dabbing in colors of blue and black and bits of ink – did it work? I don’t know. On the bits of snow in the lower left, small dots of blue to represent shadows on the white snow. Perhaps that is a bit more successful. 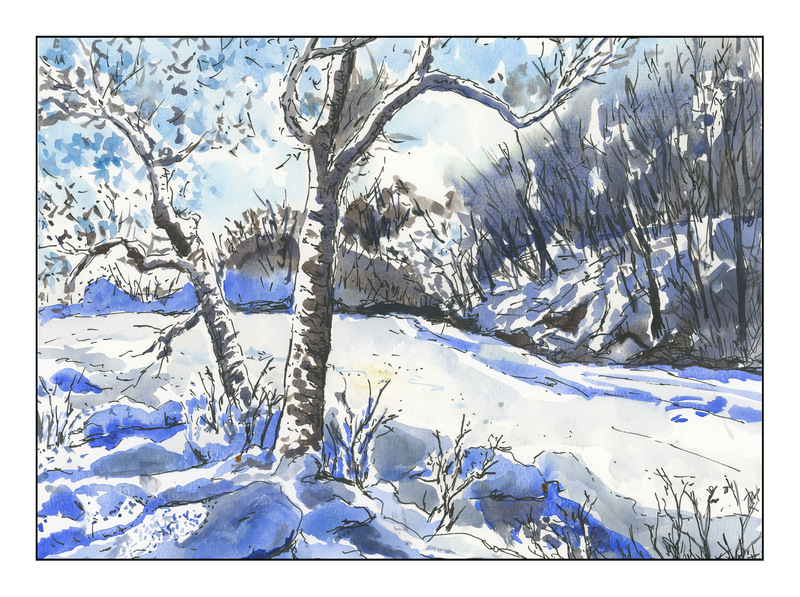 Pen, ink, watercolor, limited palette. Wet on dry. Ink on paper. Ink on painted paper. Wet into wet. A morning mish-mash, but every day I am trying to do something with ink or watercolor. Not always successful, but an everyday activity from which a lot can be learned!